BACKGROUND: Johnsongrass is a Mediterranean species brought to the U.S. as a hay and pasture grass. It spreads by seed in the north, but in central and southern U.S. it also spreads by rhizomes. Johnsongrass can produce toxic levels of hydrocyanic acid when under moisture stress or after frosts. Johnsongrass is the sixth most serious weed in the world. DESCRIPTION: Johnsongrass is a perennial species over most of its range, but because it normally winter kills in Idaho, it usually acts as an annual here. Leaves are grasslike up to 1 inch wide, with a prominent whitish midvein. The ligule is short and membranous with a hairy fringe; auricles are lacking. Stems can grow up to 8 feet in height, but our normal annual specimens will be closer to 3 or 4 feet tall. Large, open panicles are up to 1 foot long and emerge in midsummer. Spikelets are reddish in color and most are topped by bent awns. Scaly, finger-thick rhizomes are produced from the crown. DISTRIBUTION: Johnsongrass is found throughout the southern two-thirds of the 48 states and some counties in Idaho. 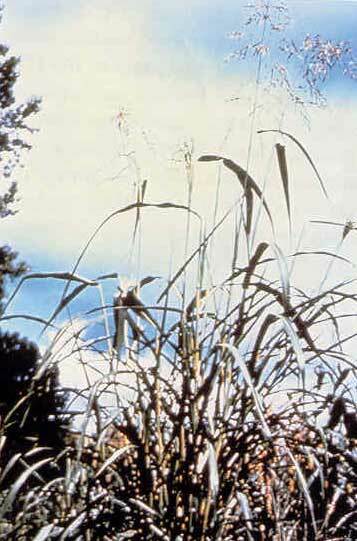 CONTROL: No biological control agents are available for Johnsongrass, but herbicides are available that control this weed.